The creation of ice roads requires the clearing of snow to expose the ice to the cold. The snow is cleared well beyond the used roadway to ensure safe ice thickness from the center to the edges of the used portion of the ice road. What do we bring to light, allow or expose so a strengthening can occur? 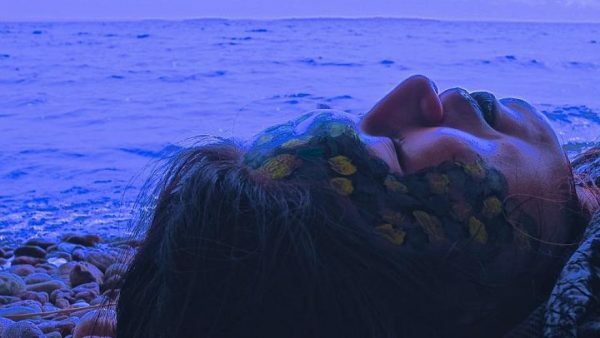 For this year’s Ice Follies, Aanmitaagzi will present a series of installations from their ongoing Serpent People project alongside artists Aylan Couchie, Reece Terris, Chris Kosloski & Andrew Ackerman, and others. For more information, please contact Aanmitaagzi or visit www.icefollies.ca. 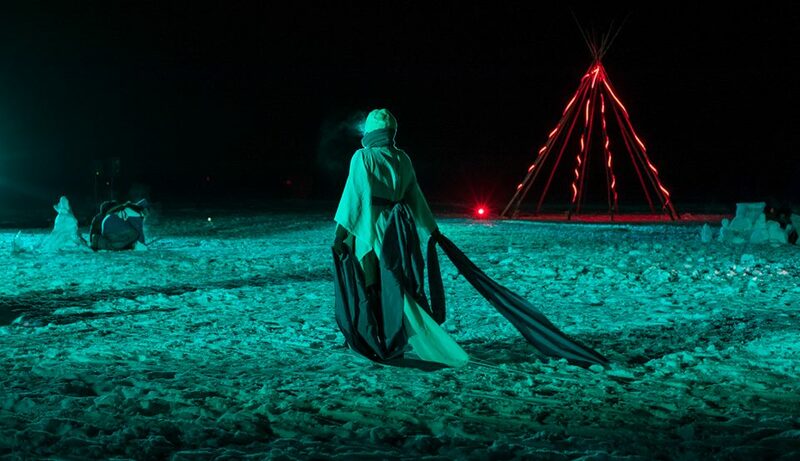 Aanmitaagzi invites artists, arts enthusiasts, and community members of all abilities to participate in their Winter Workshop series as part of their ongoing Serpent People project. The weekly workshops are free to the public and take place at Big Medicine Studio. Hope to see you there! 6:30 – 8:30 pm Pow Wow Jam! 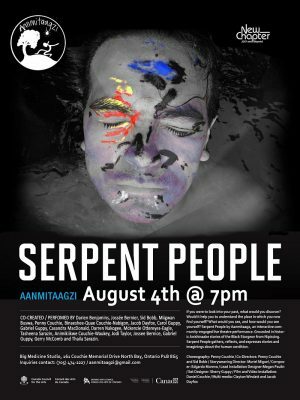 Aanmitaagzi will be wrapping up its Summer Arts Program (ASAP) with a presentation of Serpent People at Big Medicine Studio on August 4, 2017 at 7 pm. Our ASAP students and community members have been working hard all summer putting together and touring this production, and we’re pleased to be presenting it here in our community to mark the 10th anniversary of the ASAP program. The event is free, however we gladly accept donations. Please note that this performance contains mature content.